……I have bought my new home… and her name is Eunice. Here she is! 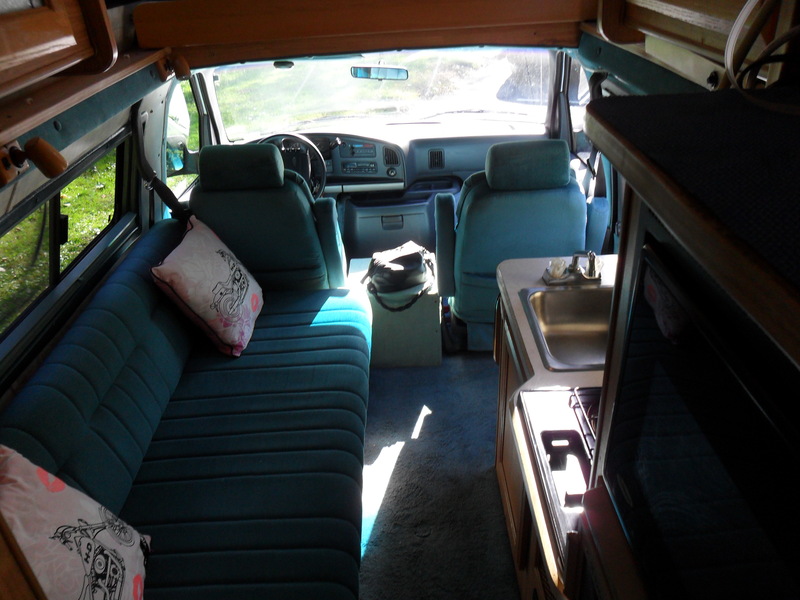 This beauty is a 1994 Ford Coachman, a fully self-contained camper van. The interior is a sophisticated teal, my favorite color. Although I would deny suggestions that this what sold me (of course I would). I put down a deposit just in time! A group of retirees, ready to buy, pulled up to the curb where the van was still displayed for sale just as the previous owner was writing my receipt. My mechanic (who kicked in negotiation services for free) talked down the previous owner, Rich, to $6,800. It was worth every penny. Rich, who declined the much higher price the old folks offered with very good grace, always made sure Eunice had the best of everything. He used a storage facility in winter, thus allowing her a relatively youthful appearance despite her maturity. She rides smooth! I picked up my RV a week ago before heading in to work. I bought locally (which I strongly recommend) so it wasn’t a big deal, time-wise, to meet Rich at my bank, transfer the title, and go to the DMV that morning. I pulled into my company’s parking lot as if I were riding in on a chariot! My c-oworkers were a little surprised that I didn’t have much fear or difficulty transitioning from a small Yaris to a large van. Before I picked it up, it was a concern of mine, too. I reminded myself that I first learned how to drive using a 1988 Toyota van. However, that was a long time ago. I also did a few visualization exercises of me driving on the road with my RV while being at ease and in complete control. When I first sat in the driver’s seat, I made a decision to deliberately force myself to do everything that intimidated me while driving my RV. I did this more out of laziness than brazen determination. It’s just too much work to avoid scary situations rather than simply overcoming them. I saw a nice parking space between two cars at work, but the side of the building across from the cars were really close; going in and out of this space with a big vehicle would be very awkward. I tried to pull in anyway and, of course, I had to reverse and pull forward about ten times as people watched, but darn it… I made it in! Highways were not a problem, because I took my honey sweet time driving. My approach to being behind the wheel had changed overnight! Instead of zipping and ducking out of people’s way (as I had with my Yaris) I joyfully take my time on the road at a leisurely pace. Staying around 55 to 65 mph is the sweet spot for me. I noticed that people gave me my space on the road. I made my first lengthy trip, an hour and half to New York, near the city. I took the tree-canopied lanes of the Merrit Parkway … it was a beautiful drive. Phase One of my gypsy plan has been accomplished. Next on the horizon (Phase Two) is to break from the nine to five, and then (Phase Three)… live the dream! Yesterday, I gave my landlord notice that I’ll be moving out at the end of the month. Wait… I have a lot of stuff to get rid of! Side Note: About a month ago, I was having lunch at a restaurant with *Candie, a good friend of mine. I think one of the reasons why our friendship is so interesting is because she’s the exact opposite of me: conventional, prudent, and steadfast in temperament. When I told her my plans of going nomad, a peculiar look washed over her face that I had not seen before. Her brows furrowed, mouth slightly down turned, yet no hostility in her eyes. She had questions and I answered them the best I could. I pride myself on being able to read people very well, but in this case, I was stumped! Afterwards, I couldn’t help but think of this poignant scene from Pulp Fiction. Have consider the same but my wife wants to tag along. Would that be the right size for the two of us, or should I move up a little? now that i think of it… i saw this RV on PINKS a tv racing program.. lol …. looks nice! …I can just picture you running “home” during your lunch break! Congratulations. Eunice is a beauty! This makes it official I guess. How will you deal with the cold weather at night.